In Disney-Pixar's No.1 US box-office hit Cars 3, Lightning McQueen meets his match in Cruz Ramirez, a sunny-but-fierce unconventional trainer at the Rust-eze Racing Center. Tasked with getting Lightning back on track after a devastating setback, Cruz isn’t shy – her training style is high-tech, enthusiastic and steadfast—she’s not afraid to apply a little tough love. But there’s more to Cruz than meets the eye. “Cars 3” features Owen Wilson (The Royal Tenenbaums) as the voice of Lightning McQueen. 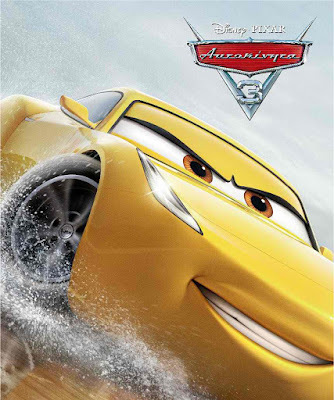 Cristela Alonzo (The Angry Birds Movie) voices tech-savvy trainer Cruz Ramirez, who tries to help #95 return to greatness, and Armie Hammer (The Social Network) lends his voice to next-gen racer Jackson Storm, whose high-tech speed leaves Lightning McQueen behind. Kerry Washington (ABC’s Scandal) was called on to voice statistical analyst Natalie Certain, Nathan Fillion (ABC’s Castle) provides the voice of brilliant business car Sterling, Lea DeLaria (Netflix’s Orange is the New Black) lends her voice to formidable school bus Miss Fritter, and Formula One driver Lewis Hamilton helps bring voice command assistant Hamilton to life. Disney-Pixar’s Cars 3 cruises into Philippine theaters on July 26, 2017.